More than 200 Met Police officers have taken part in a simulated terrorist attack on the River Thames in London. Half a dozen "terrorists" hijacked a pleasure craft heading towards London from Kent taking dozens of people hostage in the Met's first big training operation on water. The boat was intercepted by firearms officers near the Isle of Dogs. The Met said the exercise was not in response to any specific threat to the river or the capital. Just after 11:00 GMT, elite police marksmen in two small boats drew alongside the "highjacked" vessel, opened fire, boarded the craft and "neutralised" the threat. 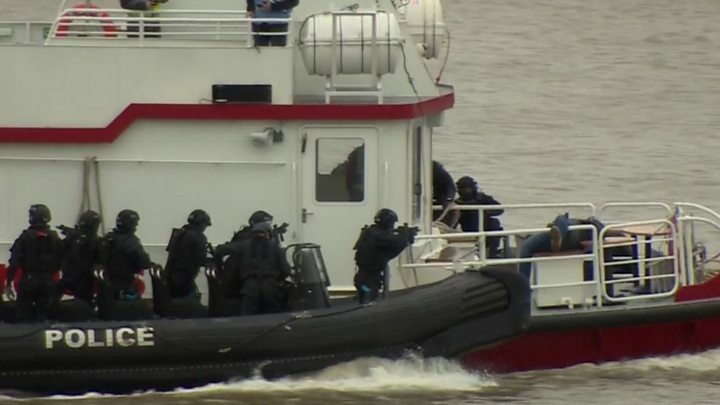 Cdr BJ Harrington, the officer in charge of the operation, said the aim was to test the capability of many parts of the Met and other emergency services while operating in a "dangerous working environment" on the Thames. "We want to make sure we're all working together so that London's got a really good response should this terrible incident happen," he said. A report last year, found security measures on the river Thames needed to be strengthened. The report's author Lord Harris called for "a comprehensive review of safety and security on the River, commissioned by the Mayor, to report by May 2017." The exercise started just after 09:00 GMT and was expected to last a couple of hours. Officers taking part had not been told what the nature of the simulated attack would be. The Metropolitan Police tweeted a training exercise was under way and that people should not be alarmed. Teams from the Met's specialist firearms unit SCO19, the Marine Policing Unit and the Dog Support Unit were all involved. Other agencies including the Port of London Authority, Maritime and Coastguard Agency, RNLI, London Fire Brigade and London Ambulance also took part. In June 2015, more than a thousand police officers and soldiers took part in Operation Strong Tower which simulated a terrorist firearms attack in central London. The threat level in the UK has been rated "severe" - meaning an attack is highly likely - since August 2014. On the 10th anniversary of the 2005 London bombings, the country's top counterterrorism officer told the BBC about 50 plots had been thwarted since the 7/7 attacks.